GRAND ISLAND, Neb. — AGCO Corporation (NYSE:AGCO), a worldwide manufacturer and distributor of agricultural equipment, unveiled the Hesston by Massey Ferguson® RazorEdgeTM 1300 Series pull-type disc mower conditioners during Husker Harvest Days in Grand Island, Neb., Sept. 11-13, 2018. The RazorEdge 1300 Series are heavy-duty, with a fully welded frame for unmatched reliability and maximum efficiency even in the toughest hay-cutting conditions. The unique RazorEdge cutterbar ensures a smooth, clean cut, and the hydraulically tensioned conditioner system reduces drying time to optimize crop quality. 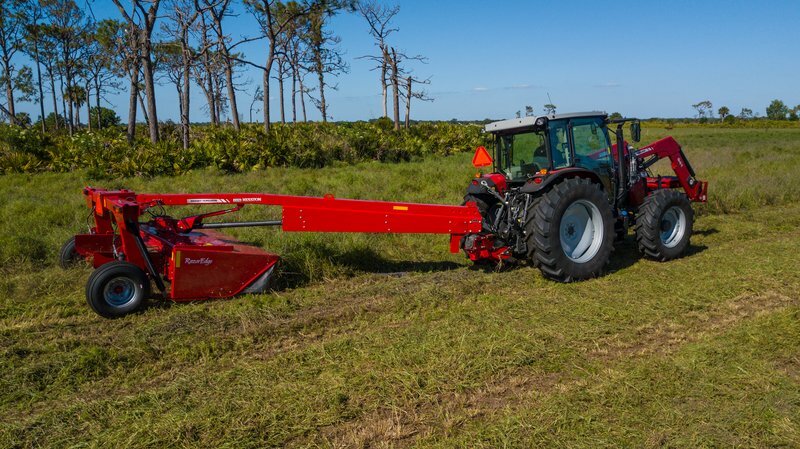 “Everything about this rugged, high-capacity mower conditioner series is designed to give operators reliable, trouble-free hay cutting performance,” says Matt LeCroy, AGCO tactical marketing manager for hay and forages. Each of the new RazorEdge 1300 Series mower conditioners is equipped with the RazorEdge cutterbar, which has a spur gear design to provide a thin profile and close cutting without tilting the header to minimize scalping, limiting dirt and debris in the crop to optimize feed value. Scrapers on the cutterbar also help keep the cutterbar clean by sweeping mud and debris off. The cutterbar also has a modular design so each gear assembly and adjacent idler gear can be individually removed without disassembly of the entire cutterbar. Counter-rotating discs provide improved cut quality while minimizing crop streaking. Each RazorEdge mower conditioner comes factory-equipped with 18-degree “high lift” bottom-bevel Radura™ knives. These sharp, durable knives are created with a special cold-rolled process for a wear-resistant edge that maintains its sharpness longer than ground-edge knives. Other knife options also are available through AGCO Parts to match various crop and field conditions. To minimize downtime, an optional quick-change knife system and the handy, new quick-change tool make fast work of replacing cutterbar knives. The RazorEdge mower conditioners crimp the crop every 3 to 4 inches with a single set of steel-on-steel conditioner rolls. This crimping action breaks open the stem for faster drying while preserving leaf quality. Plus, the herringbone tread design feeds and conditions material more evenly for improved windrow formation helping optimize crop quality, protein levels and palatability. In addition to the standard steel-on-steel conditioner rollers, operators may choose rubber-on-rubber conditioner rolls on models 1373 and 1376 and rubber-on-steel conditioner rollers for models 1393 and 1395. The rubber-on-steel conditioner rolls are fully engaged with a rubber top roll and steel bottom roll to crimp plant stems along their entire length so stems dry at the same speed. Models 1393 and 1395 use the industry-exclusive hydraulic roll conditioning tension system while models 1373 and 1376 use a spring tensioner to deliver consistent roll pressure. The 1373 and 1376 are also available with a tine conditioner or may be ordered without a conditioner. To learn more about the Massey Ferguson RazorEdge 1300 Series pull-type disc mower conditioners and the options which best fit your operation, contact your local Hesston by Massey Ferguson dealer or visit masseyferguson.us. Click here to discover more new equipment releases.